Last night, RIGHT before lights-out (standard), Charlotte projectile vomited what I'm guessing to be about a cup of milk. I'm not talking spit-up. I am talking full-fledged throw up and I was terrified. I've never seen a newborn get sick like that. I keep my pediatrician's phone number towards the top of my "Favorites" list in my phone for easy access, and I was soon on the phone with a nurse who gave me a little bit of peace about it and let me know it was likely a one-time deal. But how do you go to sleep after that?! Sleep for Charlotte has been a bit of a struggle, because when I nurse her at night she doesn't settle right back down in the bassinet like Camille did. She fusses, we nurse again, we swaddle again, and she fusses in the bassinet. Then we start the process over. Because of the vomiting, I slept with her in her nursery (Ian has a big workday today and I didn't want to chance us keeping him up all night) and she was in the Rock and Play instead of the bassinet. And wouldn't you know that it is the most successful night of rest that any of us have had since her birth. I've always been a stickler for sleeping in flat bassinets versus rock and plays, but I may be changing my tune with this babe. Anyone with experience here, I'd love to hear from you! In other news, my girlfriend Lauren brought us AMAZING sushi take-out from Sushi Guru on Friday night! This South Park restaurant is, I think, the best spot to grab sushi in all of Charlotte. We love the sashimi pizza and the South Park roll so much. After 9 months of no raw fish, sushi was a major craving. Charlotte was wearing this little Carter's outfit that I was given for Camille. I think Camille only wore it once or twice, and that's been the best thing about having another girl born in the same season -- the ability to get more wear out of outfits that I just love! My washer/dryer didn't exactly get that memo, though, as I pulled baby laundry out of the dryer Saturday morning only to discover that Camille had put a purple and blue crayon in the foot of her fleece pajamas (ouch) ... and I now had blue tie-dyed baby clothes. I'm STILL working on getting the blue out of some of these outfits. Several pieces may be too far gone for saving, but I'm trying to be patient and optimistic. I wanted to ugly cry. 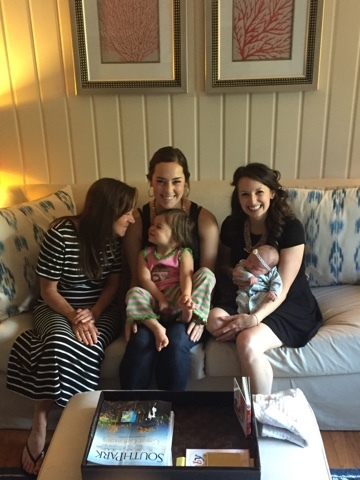 I was able to escape for a bit with Charlotte and go to Mindy's baby sprinkle at Cafe Monte! There was another slightly younger baby there, and it was nice talking to that mom. 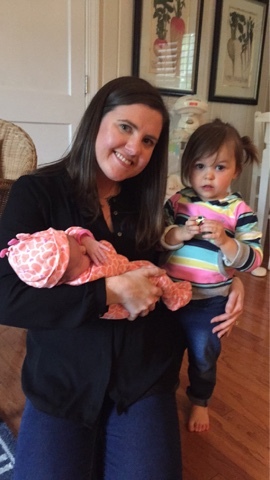 Later that afternoon, my family members that live outside of Winston Salem drove in to meet Charlotte and bring Camille some special big sister gifts. Sunday ... ahh, Sunday. Camille woke up and soon became very lethargic with watery eyes. A quick temperature check showed she was running a fever of 103. Ian swept her off to the pediatrician and a few doses of Motrin later and she was right as rain. On the flipside, we let her watch part of her first movie ever. Love the free kids movies you can watch on demand! The rest of the day was spent around the house with my recovering toddler and my cluster-feeding newborn. Can't say I hated getting joint snuggles from them (while trying to still keep Camille at a safe distance). 2) New moms will always hug you for sushi delivery. The more raw fish, the better. 4) Always check footed jammies for crayons in the toes. And from here on out, only buy washable crayons. Seriously. I just purchased them from Amazon (here) and am trashing the others. Both of my daughters (4 years old and 20 months old) initially slept in a rock n play. My older daughter was born right as they were coming out, and they were actually recommended for sleeping at the time! :) And both transitioned to a crib with no problems around 6 or 8 weeks. I loved that I could keep them right next to the bed and reach out and rock them while still asleep, ha ha! Congrats on your sweet baby girl! I was insistent she was gonna sleep on a flat surface, but after no sleep I tried her in the rock and play and we slept! She slept in it til a little older than 3 months and she started rolling during play times and I decided it wasn't safe anymore so we transitioned to crib with swaddling no problem and quickly transitioned out of swaddling too with no problem! Rock n plays are the best! I have triplets, and granted they slept in their cribs from day 1 when they got home, the rock n plays were the BEST for when we were downstairs just hanging out! So easy to sooth them and perfect size for a little one! Definitely recommend them! My sister has three kids (at different times) and she used the rock n plays for each child before they transitioned to cribs, and recommends it to everyone who is struggling. Obviously you have to do what is right for your family, but I defo recommend!! Congratulations all around!! My daughter, a little over 2 now, slept in the rock n play for the first five months of her life. She had such bad reflux I was terrified of letting her lie flat. Every now and then she would nap in her pack n play. Rest easy and do what you think is best! We had a projectile vomit baby! It is TERRIFYING and exhausting (bc then you have to feed again). We found a probiotic to help (reduces gas) and more frequent burping during feeding helped reduce vomit. We definitely did the rock n play at night and switched her to the crib at 5 or 6 weeks, and she did great. I think if you wait a long time to switch them to the flat surface crib, it may be more difficult. But the elevated rock n play definitely helped in the early weeks. Good luck! We used the RNP on nights where she just wouldn't sleep in her crib. So I would try for the crib first but if she was up a time or two she would finish the night in the RNP. And I'd use it to get one good nap a day. By 3 months or so she was in her crib full time at night but when the 4 month sleep regression hit us hard it was back to the RNP. Once we got through that she's been in her crib and doing fine ever since!! I'm sad she's out grown it already because it's amazing! LOVE the rock and play!!!!!! I was such a rule follower with my son until I realized that all following the rules did was make everyone unhappy. My son primarily slept in the Rock and Play until he was 6 months old. I was so worried about transitioning him to the crib and what would happen when he went to day care. It all ended up not being a big deal at all. With my 2nd babe due in 2 months, I'm changing my tune and planning to not worry about all the rules this time around. Whatever keeps everyone happy (and gets everyone sleep) will do just fine! Congratulations on your little peanut - your girls are adorable! PS - I would love to hear your boy name(s) - we have a 21 month old, Camden and baby #2 is also a boy. We are struggling with boy names big time! Any tips on where to look for that perfect baby boy name?!? Never commented but had literally same situation as you with my girl who just turned 1. Her older brother would nurse and settle but she would grunt and just not settle at night. I am a stickler for not using the RnP and kept with it for her. My thinking that while it was painful for a few weeks while she got used to sleeping on her back it was worth it vs. transitioning out of the RnP. I did use towels to prop up her mattress a bit which helped. She also ended up having a severe milk protein intolerance which was causing her discomfort. I gave up dairy for 7 months (hello weight loss!) and it fixed a lot of her discomfort.. She can now eat dairy no problem. We had a hard time transitioning our first out of the rock and play and into the crib until a friend lent us the Tiny Love 3 in 1 Rocker Napper. It allowed us to prop up the one side so her head was elevated, like in the rock and play, but was flat so she got used to sleeping on a flat surface. It was a LIFESAVER! 2 weeks in there and then the crib transition was so simple! 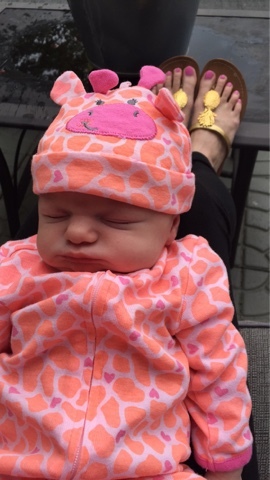 That giraffe outfit is adorable!!!! My daughter (right around Camille's age) slept in a RNP in our room for the first 2 months and took most of her daytime naps in one as well. We didn't have much trouble transitioning her into a crib when the time came- I'd say we had maybe 2-3 rough nights and then she seemed to adjust just fine. I have some friends whose babies slept in RNPs for several months and they seemed to have a much harder time transitioning so I'd agree with the earlier comment that it gets more difficult the longer you wait. Good luck with whatever you decide! I second all the comments about the Rock N Play above. I was against having my baby sleep in the RNP and wanted her to get used to sleeping flat. After the first week of not getting much sleep, I decided to try it for one night and that was the best she slept. My first baby hated being swaddled, so I think the snugness of the RNP was what she liked the most. We went on a cabin vacation when she was 9 weeks old, so I kept her in the RNP through that time. At 10 weeks, I tried her in her crib and she did just fine. I think in those first few months you do whatever you need to get some sleep for you and your baby. My favorite sleep book (The Sleepeasy Solution if you are interested) says there are no bad sleep habits in the first few months. I hope the RNP works for you. My youngest slept in her car seat for 6 months. Do whatever works and is safe. My son was in the rock and play until 10ish weeks. I started putting him in his cribs for naps when I started baby wise around 7ish weeks. He did great! They nap anywhere they can when they're new anyway, flat, reclined, swing whatever. When he started hating the swaddle around 3 months, we used the merlin sleep suit to transition him to the sleep sack. LOVED the sleep suit. You've got this! We did the rock and play for night sleeping until 6 months and it was amazing! When it was time to transition to the crib, it went smoothly! I have a granddaughter and a grandson born seven months apart and the RNP was the only way I could get either of them to sleep for me. It was heaven sent. I SWORE by the rock and play. Hadley slept in it every night (and for most naps) right beside our bed until she was 6 months old. Then, I moved her to the crib in her room and never looked back. 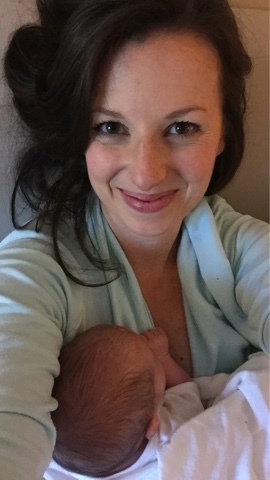 It was an easy transition and it helped with reflux and gave me peace of mind that she wouldn't choke in her sleep. She also has a perfectly shaped head -- no flat spots. Another rock and play graduate here :) My daughter had reflux (ended up on Zantac for about 4 months) but the Rock and play really helped. We transitioned to her crib by first using a crib wedge under her mattress (it was only about $15 from babys r us). Once she was rolling herself over, we removed the wedge and she was fine on the flat mattress. Leo had a one time throw up session and it scared the day lights out of me too. It was at like 4:30 and I begged the doctor to see us before 5. Literally showed up to the office covered in vomit, and her notes "babies throw up". Having her see him did make me feel better but it rattles your soul. Also, I a, very PRO rock and play. It didn't delay our transitions and if anything, taught Leo how to be a solid sleeper from a very early age. The Rock n Play seriously saved our lives! He needed to be upright for about 10-15 minutes after a feeding and it was exhausting. As long as they have good head/neck control, the Rock n Play is amazing! She looks like a strong girl. And it was something he just grew out of. And he's still an awesome crib sleeper! Hope your girls are feeling better! Our little one slept in a MommaRoo (not sure how similar that is to a rock n play) for her first three weeks. I was super nervous that she wasn't lying flat, but, it turned out to be that or no sleep for anyone. 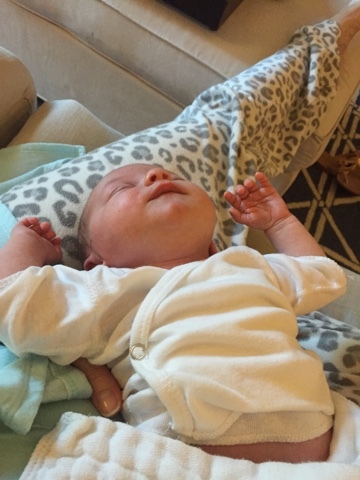 Transition to the bassinet was a breeze at week four and we never looked back. Good luck. Our pediatrician said do what you have to do to get sleep for the first eight weeks! My daughter slept in the rock'n'play for about the first two months (with occasional naps in the pack'n'play or crib), and we transitioned her to her crib at night around two months. She might have slept a little more fitfully the first few nights in the crib, but the transition wasn't a big deal at all. I'm due with #2 any day now and fully intend on having him sleep in the rock'n'play! The RNP was a lifesaver for us. My son (6 months old) has acid reflux really bad and sleeping flat was not in the cards for him. We moved him to his bed at 4 months but elevated one side of the crib so that he was still sleeping somewhat on a incline. He sleeps better in his bed than he did in the RNP. But as a FTM I was scared to put him in his bed with the AR. Just do whatever works for you and that sweet baby. Every baby is different. We used the Rock and play for the first month and transitioned without a problem to the crib. We did use the RNP a few times after that when she had a cold, it helped her breathe better! Not only do they like the incline but I think they like the feeling of being snuggled! We used a MamaRoo in our room for the first 6 weeks or so, and then transitioned to the RNP for another month or so in the nursery before moving to the crib for naps and then nighttime sleep. Worked for us with no problems - and traveling with the RNP as the "crib" is very easy too. My baby was the exact same way. We used the Rock and Play for all sleeping for the first six weeks because Anna Grace was super fussy and had a little reflux. (The incline helped with that.) Then we slowly started introducing the crib for naps and such and she did great. 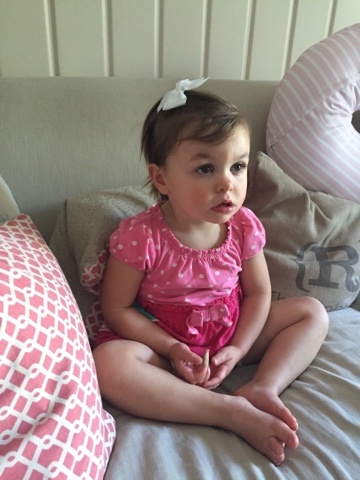 If Charlotte seems to have reflux let me know, we tried a million different things and I can give you our favorites. Whew what a few days! You're giving me a glimpse into my near future. So glad both ladies are feeling better. My girlfriend swears by the rock and play especially for refluxy (not a word haha) babies. I used to put my little girl in the R&P (fit easily in my bathroom) when I would take showers when she couldn't roll over. SUSHI-so glad you got to have some! Yum! You look great and the girls are so adorable. Congrats again! I don't know what a rock n play is, but I sure wish they had been around when my boys were babies! I say do whatever works best for you, sweet baby and your family. Every baby is different and you just never know what will work until you try it. Hope Camille is feeling better!! We used a rock n play for our baby girl for about 2.5 months - so much better than flat sleeping since we wanted her close to us but without sleeping on a flat surface until she was older. We transitioned her slowly to the crib so I could go back to work at 3 months. I would let her sleep in the crib for naps for about two weeks then pulled the trigger and she slept in the crib for nighttime sleeping. We did not have a problem with transitioning from the rock n play to crib. If we have another baby, we definitely will use the rock n play for nighttime sleep at the beginning. Girl, that Rock and Play is a game changer! We used it for both of our babies for the first few months of their lives for all of their nap times and some of their play time. We never had any issues transitioning to the bassinet at night even if they had been napping in it all day. And on nights when they were fussy or congested we would let them sleep in the Rock and Play all night. Neither of our babies ever had trouble going back and forth. Rock in play was our lifesaver! Our little boy slept in it for the first 4.5 months. He is now 6 months and sleeps great in the crib. We started the transition around 3 months worth naps in the crib - this helped I think:) Camille and Charlotte are both precious! First movie...EVER? Woah good job mama because I am fairly sure Elsa has been a part of our routine since P was about 14 months old!! Do whatever you need to do to get some shut eye! I have 2 boys (3 yrs and 9 mo) and both slept amazingly well in the RNP and went easily to laying flat. We went from thr RNP to the pack n play in our room then the crib. Easy peasy. And both boys slept through the night by 6 weeks. Lilly used to projectile vomit her milk like that ALL THE TIME her first 2 months. The pediatrician was never concerned -- she still got plenty of milk; she just sometime over fed herself and I had an abundant supply with forceful letdown so it just happened. So don't get too worried if it happens a few more times!! Also she only slept well in the Rock N Play until 3-4months. It's hard for newborns to go from tight comfy quarters of the womb to a flat hard surface to sleep. She easily transitioned to the flat pack & play and then her crib by 4 mos. We never had fears she would suffocate bc she was always on her back, just snuggly and propped up a bit. I have even considered bringing my rock N play to the hospital with me for baby #2! It allowed Lilly to sleep 6hrs straight from the first night we came home from the hospital -- so worth it!!! I used the Rock n play with my daughter until she was around 3 months old. It was the best thing especially being a first time mom. We would swaddle her and then put her in the rock n play each night. When we decided to start the transition her to the crib we started with at least one nap a day. Just chiming in to say that BG slept in the rock n play for four months and then his flare crib without an issue. Not sure if that's the norm but that's the way it happened for us! My Son Duke slept in the rock and play for the first six or seven weeks right next to my bed for easy breast-feeding access. He became quite the noisy little sleeper so I transitioned him into his crib after that and there were no issues ! I hope it works great for you ! Well you've gotten a lot of feedback on the rock n play! Ha! Both of my sons had reflux and slept inclined in the nap nanny for the first few months. Reid spit up all the time. It did take a little transition period to go to the crib, but they never would have slept laying down during those first few weeks/months. Here are my suggestions as an "older" mom...only buy washable markers, too and make sure that they only use them on a place mat etc (and not carpet directly). Magic erasers will be very handy to have several around. They work amazing on getting things off the walls. And shout color catchers and Carbona color run (in a little yellow bottle) are both great laundry things for people with kids. And blue Dawn dishwashing liquid is an amazing stain treater. I had no idea about that one until recently. :) Congrats on your sweet girls. Lottie slept in the RNP next to our bed for 6 months because she was a projectile vomiter and so tiny. No problem transitioning here. Enjoy those baby snuggles and sorry about your laundry! Oh goodness/ so many comments! You probably don't really need one more but here goes : ) we are the biggest fans of the rock and play, I mean like diehard. Lawter slept in it as a baby and has always been a good crib sleeper too. Tell doesn't go back down nearly as L did - i'm having a really hard time reminding myself that all babies are different so I shouldn't have the same expectations! I just read this post and was nodding the entire time! Both of my boys would vomit large amounts if they ever laid flat. I literally had the changing pad wedged at an angle! My pediatrician recommended they sleep in a bouncy seat or rock n play until they could roll over (around 4 months) and they slept amazingly well! Like through the night at 6 weeks. The ped said their "lower esophageal sphincter" wasn't developed yet. Hope the incline works for you guys!! I didn't have a Rock and play with my oldest, but it was a LIFE SAVER with my youngest. She just would not settle down when she was a newborn, and she also would spit up quite a bit (and actually, it was more like projectile vomit too...not just spit up). We transitioned her to her crib with no problems when she was about 4-5 months. I have a 5, 2.5 and almost 4 month old and ALWAYS did flat crib sleeping... Until this one. She had been in the rock n play since day 1 and I was so scared when she started to outgrow it. About 2 weeks ago she up and decided she would sleep in her bassinet with no trouble whatsoever. Long stretches (1.5-2 hrs) during the day and sleeping through the night (6 hours) before waking to nurse. I truly believe she was just ready for the transition! Good luck! I love reading your blog! Another RNP to flat surface champion here! I did it gradually with a thick, folded blanket at the head of (and underneath) the bassinet mattress. Then a thinner blanket a couple days later, then...voila!...flat surface! We even still used the RNP for easy travel until her legs spilled over the edge and she would still go right back to sleeping flat. 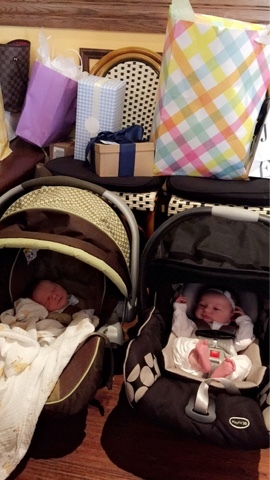 Glad to hear that you both got a better sleep thanks to the rock n play! Anything in the name of sleep, right? Lol! So Abby is still in the Rock N Play...at 5 months. She has acid reflux so that flat surface in the bassinet was NO good. She sleeps in the Rock N Play every night, and has been sleeping 8-10 hrs since 2 months...so there's that. You have a lovely family!! So glad to hear your family is settling in nicely! When my son was around the same age as Charlotte we had a similar projectile vomit issue. It was terrifying aND as a first time mom I had no idea what was wrong. As it turned out I had a forcefully milk let down from my right breast and my poor little baby wasn't old enough to handle the flow. I had to pump from my right side for 3 months before he could handle breastfeeding. Doesn't seem like this is the case for you but I just wanted to throw that option out there. Your girls are beautiful and I hope Camille is feeling better! Avery slept in her rock n play for the first 4 months! And transitioned to her crib what I thought was really well, but we hit the 4-month sleep regression shortly after that until she figured out how to roll over well enough to sleep on her tummy. So maybe not so great of a transition as I thought? We didn't have any reflux issues but I do think the snug secure feeling makes a difference! I am hoping the dock a tot helps us with the transition this time!! My twins slept in the rock n plays for the first 2 to 3 months that they were home from the NICU. We wanted to make sure they slept at a slight incline (due to learning to eat slowly and being in the NICU), could be next to us for the first month or two and they liked that swaddled feeling. The rock n play helps them feel swaddled and close. I firmly believe in the rock n play. We did transition them to their cribs around 3 or 4 months and it was pretty easy at that point. If Charlotte likes it, you all get more sleep and she is a happy baby, I say go for it! Do what fits your family. Whew. 64 comments! You may not get to mine! haha! For the first 2 weeks of James's life, he slept in the rock and play (mostly napped too). Leading up to that, we'd swaddle him and put him in the crib for naps and after week 2, he was in the crib for nights too! At 8-9 weeks, we started getting consistent nights of 9pm-6am sleep and it. is. amazing. With Charlotte's vomiting and fussiness, she may be having some reflux and the rock and play, since it's at an angle, should help with that! Also, James has had about 5 vomiting spells like Charlotte (so much milk!) but never any fussiness along with it - could be overfeeding? or I've noticed it can happen if he doesn't burp well in the middle of a feeding and I "feed over a burp"? I totally made that up, but it makes sense in my mind. Good luck! They're both precious! I swore I would never get a RNP -- they were just coming out when L was born and I was admittedly super judgy about them. Then B was born and he would sleep BEAUTIFULLY...so long as he was snuggled. Bed-sharing just was not within my comfort zone so I ate crow and we got the RNP and it was a total game changer! We kept him in that thing until he was trying to flip out of it (5 or 6 months!) -- I would have paid a pretty penny for a larger size! We had maybe one or two rough weeks transitioning to sleeping on a flat surface (raising the crib slightly on one end with magazines to create an angle actually worked pretty well), but after the transition, he continued to sleep great. Those rough two weeks were well worth the great months of infant sleep! I just visited friends who live around the corner from cafe monet and so we popped in for lunch the other day! Hands down the best meal I've had in a while! I want to come back to visit her just for that. Ps. She has a daughter about Camille's age-another new friend! And she's a Nicu nurse-another nurse to ask questions too!! Wow, so many comments, but just to add a voice to the choir, my son slept in the RNP for nights and many naps for the first two months, and the transition after that to a flat surface pack-n-play and later a crib went just fine! Breastfeeding was very difficult for us at first, and looking back I do think his esophagus and tummy just had some maturing to do, and if the RNP helped him during that time, so much the better! Good luck! She may have reflux. That sounds about how feedings with my newborn went. I hated to put her on meds, but the projectile vomiting and fussing after eating stopped once we did. Good luck mama! My newborn is the exact same as Charlotte! She cries, we feed, swaddle, and start all over again as soon as I put her down. She's in a rock n play right now because she spits up a lot. We had our son sleep in the rock n play (he's the same age as Camille) til he was 5 months. The transition to a crib wasn't easy but he was a difficult baby in general.